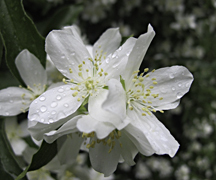 One of the loveliest native shrub of the early summer is our native Mock Orange, Philadelphus lewisii with its clusters of showy white flowers. The state flower of Idaho, it was discovered by Merriweather Lewis and gets its common name from the delicious orangey scent that makes it attractive to bees and humans alike. 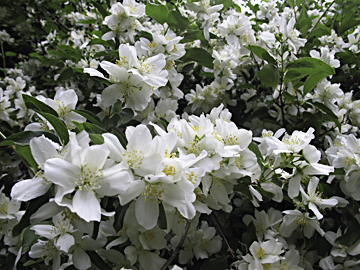 The mock orange can be found on the north side of the park next to the service road leading up to Chimney Bridge. Take a moment to smell the flowers. The mock orange will flower for several weeks starting in early June. 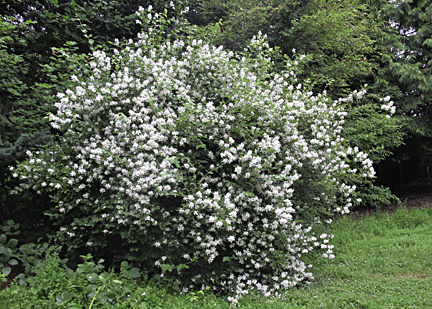 Its tall, arching branches are covered with a multitude of snow-white blossoms of usually four petals, bright yellow in the center. The stems were used by native Americans for making arrows, bows, combs, tobacco pipes, and cradles.